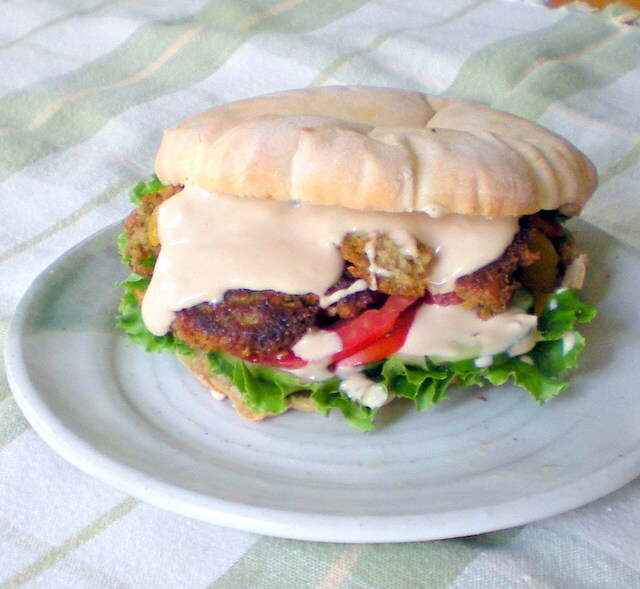 Build your sandwich by adding 3 or 4 falafel patties, your favorite assortment of veggies, and the tahini sauce to a freshly baked pita. *Note: I’ve used canned beans for years with this recipe. But recently, every time I attempted it, the falafel would virtually melt away while frying. After a bit of research, it seems reconstituted dried beans are the answer. I don’t know what’s changed, but there you go. Entry filed under: For One or Two, Main Course, Middle Eastern, Popular Ethnic Dishes, Vegetarian. Tags: falafel.